Angono Rizal is known as the "Art Capital of the Philippines", because it is the hometown of many famous artists including two of the country's National Artists - composer and teacher Lucio San Pedro and painter Carlos "Botong" Francisco. But aside from this, the small but picturesque Angono is also well-known for its town fiesta which celebrates the Feast Day of Pope Saint Clement or San Clemente, the patron saint of fishermen. The festivity is now more popularly known as the "Higantes Festival", since the traditional procession features giants ( or Higantes in local parlance) made of paper mache and usually measuring 10 to 12 feet in height. Although San Clemente's feast day falls on the 23rd of November, the revelry begins a day before with marching bands sponsored by each barangay joining in a parade that passes thru the main streets of the municipality. The events on the 23rd though, is the one to watch out for, since it showcases one of the most delightful processions in our country. Imagine yourself being bombarded with a visual and musical spectacle featuring parehadoras in their colorful costumes and cute small paddles and wooden shoes marching in an odd "papadyak" style; around 20 marching bands belting out the latest popular hits; and Higantes with their hands akimbo and swaying to the beat as well. Add to this the vibrant (with a spattering of outrageously insane) ensemble of enthusiastic devotees who squeal or giggle every time someone sprays or douses them with water and a mini water battle ensues. Yep, you have to be prepared to get wet even when you are just a spectator. Needless to say, Angono's Higantes Festival is touted as a tourist generating event in the country. The pageantry and grandeur of the Higantes Festival has attracted no less than the world's largest consumer products company, Procter & Gamble, to launch its equally gigantic event dubbed as "Higanteng Linis". P&G highlighted its Higanteng brand of detergent powder- ARIEL. In unison with the Higantes Festival, all components of Ariel's event was gigantic or Higante in magnitude, indeed. 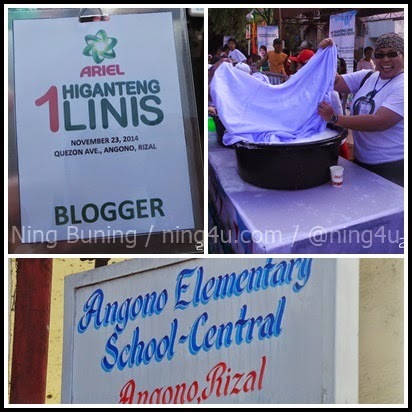 ARIEL conducted a Higanteng Linis treat last November 23 for the people of Angono and its visitors,right in front of Angono Elementary School-Central entrance along Quezon Avenue. FREE shirts were given, as well as food and raffle stubs to all of those who registered for the event at 11 AM. 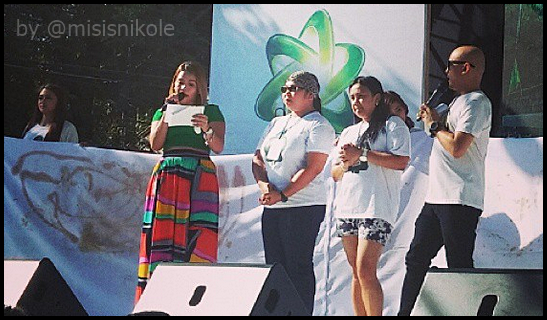 The Higanteng Celebration was hosted by MOR 101.9's DJs Cha-Cha and Papi Charlz who welcomed the participants and started the event with a meaningful prayer. Thereafter, the hosts gave the signal for the entry of food via the Higanteng Palayok. Look at the the photos to believe that there was a Higanteng palayok flowing with food, really. Hehe. And what comes with Higantent Palayok? Of course, it's Higanteng Kainan (eating)! The participants, especially the children, enjoyed the food prepared for them like humba, beef steak, sisig, and rice. In no time, the clean white table cloths started to get stained or soiled with oil, food ingredients, and more. 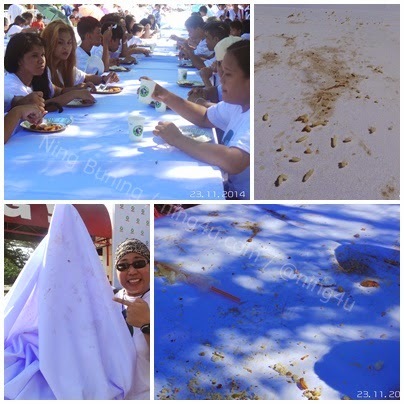 Even the lower part of the table cloths became dirty because the participants also used it as table napkin. I think at that time no one can stop them from intentionally soiling every table cloth, especially when they heard that two of the most stained ones will be given 4,000Php cash prize each. And yes my dears, even when it comes to soiling the table cloths, the Angono residents were pretty artistic. They all made the table cloth as their canvas for painting, but this time with stain and dirt hehe. ARIEL laundry women (labanderas or ARIEL ladies), who unfortunately are not Higantes also, flexed their muscles to warm-up, and waited for.....drumroll please, Yes! Higanteng Labahan! Then the time has come to wash all the stained table cloths. They seemed to enjoy it so much, that even I joined in. And, Whoa! There, with my own two beautiful eyes (ahem), I witnessed the effectiveness, efficiency, and reliability of ARIEL. Those stains, those Higanteng Stains were nowhere to be found after their encounter with Ariel. So, in the end I was in a Higanteng Shock and Higanteng Awe and Higanteng Pagkamangha with the power of ARIEL detergent powder. So, how were all those Higanteng Stains removed from the planet Earth? All the table cloths were treated with Higanteng Wash, one-by-one in one (1) wash with ARIEL detergent. We soaked each cloth in a basin with a mixture of water & Ariel for only around a minute. That's right it only takes a minute for ARIEL to conquer those Higanteng tough stains. We then hand-washed, rinsed, then dried it off quickly thru a dryer stationed at the end of the line of the washing area. We did all of these steps until we have washed all of the table cloths. Because ARIEL is so powerful, I never really felt a Higanteng Pagod even with all the table cloths we washed and inspect as well. By the way, I also had a chance to be one of the Stain Inspectors tasked to assess or evaluate the table cloths before and after washing. The Higanteng table cloths that presented onstage were meticulously examined by us (with co-blogger Ria) Naks!! The table cloths were definitely and absolutely clean and smelled fresh too! And i did not do my job as a Stain Inspector haphazardly, mind you. I meticulously examined the table cloths for stains and hmmm, like a poll watcher, I also made sure there was no switching of table cloths. No such thing happened. ARIEL incredibly got rid of those stains in just one wash. True to its advertise that Kris Aquino always saying at the end, ARIEL is "Better Stain Removal In Just 1 Wash"
The event did not end in washing those Higanteng Table Cloths, though. Higanteng Games like "bring me" and more were facilitated by the DJs and ARIEL gift packs were given to lucky Higanteng Raffle winners. The winners had big smiles on their faces because they not only brought home cash, ARIEL loots, but also a sack of rice. But every one turned out to be a winner because no one left empty-handed. ARIEL gave treats to all of the participants in the end. While the Higanteng Wash was ongoing, Higanteng Rock-rakan by Teddy Corpuz and his band ROCKSTEDDY dominated the stage and performed hit songs of the band as well as OPM bands' music, to the utter delight of the crowd. The portion that all had been waiting for to happen is the Higanteng Parade of Higanteng table cloths, proof of Ariel's stain removing power. Almost 114 long table cloths were washed in ARIEL. During the closing remarks, the hosts announced that all the Higanteng table cloths, washed clean and smelling fresh because of Ariel, were ready for take home. ARIEL was generous enough to give it for free to each family who joined the event. ARIEL's Higanteng Linis was a Higanteng Success! 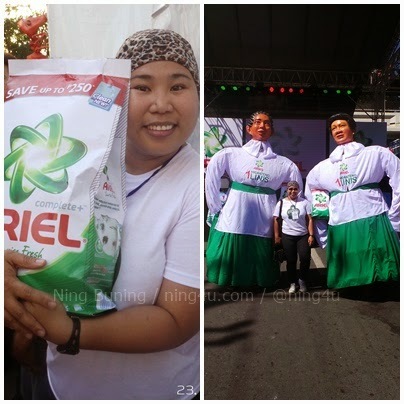 The Higantes Festival this year became more meaningful thru P&G's sponsorship of Higanteng Linis in 1 Wash of ARIEL. 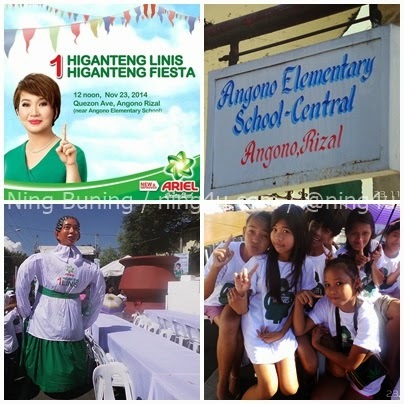 The Higanteng Linis catered to almost 1,000 people of Angono, Rizal, who were very grateful and who were sincerely saying "Higanteng Thank You po, ARIEL" to the organizers. 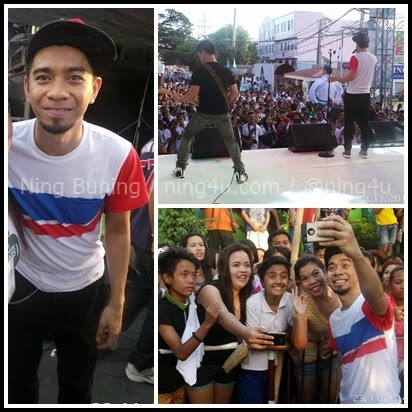 As for me, I really did enjoy that day of grand, gigantic, Higanteng Linis during the Higantes Festival at Angono. Even that day was also the Higanteng Laban of Pacman with Algirie, we successfully won our own fight with the Higanteng Stain in Angono with the help of ARIEL's Higanting Linis. Here's my Higanteng Thank You din po ARIEL! Until next year (fingers-crossed)! Haaayyyysss... Higanteng Paghihintay... Heheh...joke lang ! !.